Pergamon and its Multi-Layered Cultural Landscape shows remains of the Hellenistic Attalid, Roman, Byzantine and Ottoman empires. 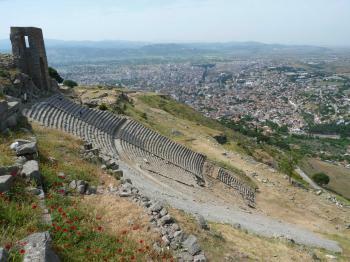 It became the capital of the new kingdom of Pergamon which Philetaerus founded in 281 BC, beginning the Attalid dynasty. The Attalids ruled until 133 BC and became an ally of Rome. The city of Pergamon expanded greatly during this period. Later the city became capital of the Roman province of Asia known for its Asclepieion healing centre. The sculptural frieze of the Great Altar at Pergamon was removed by German archaeologists in the late 19th century, and was put on display in the specifically built Pergamon Museum at Berlin's Museum Island in 1901. The remains of the ancient Greek city of Pergamon are famous both for their location – notably its Acropolis superbly situated on the top of a steep hill near the modern Turkish town of Bergama, and for the fact that the Pergamon Museum in Berlin holds the magnificent orginal Altar of Zeus removed from the site in 1871. However the inscription of “Pergamon and its Multi-layered Cultural Landscape” shows the site to be a bit more complicated than this! In fact it consists of 9 locations - the major area which includes not only the Acropolis and the Askeplion healing centre situated a few kms apart but also Roman and Ottoman remains between and a Roman aqueduct to the north. A few kms further away is the Kybele Sanctuary - a rock cut shrine dating originally to pre Hellenistic times and then 7 scattered tumuli . All this was packaged together with its grandiose title. ICOMOS was not convinced and recommended deferral for a number of reasons but primarily to “Refocus the nomination on the Hellenistic and Roman periods to justify the value of the property as the Hellenistic capital of the Attalids and its subsequent inclusion in the Roman Empire which allowed Pergamon to extend its role as a cultural centre”. The WHC overruled ICOMOS on this one and the site was inscribed as nominated! For better or worse we decided to concentrate on the Acropolis, the Asceplion and only take a quick external look at the Red Basilica. (We picked up a bit on the Ottoman town during the previous evening and on our drives across town - it seemed pleasant enough but nothing “special”). It is worth mentioning that each of these has separate entry fees. So the Acropolis cost 25TL pp and the Asceplion 20. A visit to the former is going to need at least 2 hours and the latter another 2 taking into account getting to it. The Red Basilica will be passed as you descend from the Acropolis - I didn’t discover its entry fee. It is under significant reconstruction. We had a car to drive up to the Acropolis but many will take the cable car at 12TL. It would be quite a long walk as the road circles the hill. Obligatory parking at the Acropolis and at the Asceplion will add another 5TL at each – though the latter could easily be avoided by parking a few hundred metres away. 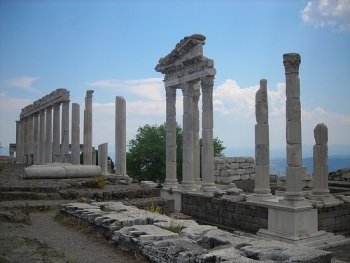 Both sites are firmly on the “Tourist Bus circuit” as Bergama is within easy day trip reach of Turkey’s Aegean resorts. Although the site opens at 8 am we didn’t enter until about 9.45 because of our hotel’s late breakfast hours (unfortunately as in most Turkish hotels!) but the groups were reasonably well spread out and not too much of a hassle. As with most Turkish sites the bilingual signboards were excellent as regards their English content and there was little extra to be gained from our 2 guide books and print downs from the UNESCO site. The site of the infamous “Altar of Zeus” is visibly a platform surrounded by a jumble of stones but quite small and diminished by the trees growing on it. I found it quite difficult to imagine the large 3 sided structure with its friezes, steps and columns I had seen in Berlin actually in situ (and, as the on-site models show, it was only a part of a larger total structure). The Theatre at Pergamon is something special – and we were getting a bit “theatred out” on this trip as every site we visited seemed to possess one. It is very steep and narrow with amazing views out to the countryside. The rest of the site contains the sorts of pillared structures you would expect in a Greco-Roman ruin – The Traianium is quite fine. The Roman aqueduct which extends the WHS some distance to the North is clearly visible from the site and is indeed quite a feat of engineering. Notably, the modern authorities haven’t been able to pipe enough water in to provide toilets within the site - perhaps they should learn something from the Romans!! We then moved on the 2+kms to the Asceplion, passing the Red Basilica for a quick view. Among the interesting aspects that we did take in there were that the Romans built the original Serapion temple on a series of “tunnels” known as the “Pergamon Bridge” since, as they are not underground, they are in strict terms actually bridges and, at almost 200m wide, among the largest such ancient structures in the World. The road you will use still runs on the bridge to this day! The Asceplion requires yet another entrance fee but I would regard a visit there as essential. Most people reading this are likely to visit these sites under their own steam but it might be worth mentioning for anyone thinking of taking a “tour” from the coast that not all tours to Bergama include the Asceplion (let alone the Red Basilica) and concentrate solely on the Akropolis - they have to fit in such things as lunch and souvenir shops (!) – so, if you are thinking of taking one of these, check what is included. The Asceplion is perhaps the world’s most famous ancient “medical centre” and the place at which Galen (131-210AD) practiced, developing both his knowledge of anatomy and his philosophy. I noted that his main job was to tend to the wounded Gladiators! I also rather liked the idea that it was approached by a long covered sacred way (whose base is still visible) - but, at the start, intending patients were interviewed by priests who determined whether or not they could “benefit” from the treatment on offer! No doubt they didn’t want too many dying on them! The most interesting parts to us were the sacred springs from which visitors were still taking water and the treatment/sleeping areas. The excellent signs describe the treatments on offer, which covered a whole range of psychological aspects (sounds of music and running water as well as praying and interpretation of dreams), through diet, bathing, blood letting, purging and (sometimes) surgery. All in all, an interesting site showing a different “take” on ancient life from the majority of ancient sites - though it does also still have a ruined theatre! Ibn Battuta: "We continued our journey from Maghnisiyah and came to the city of Barghamah [Bergama/Pergamon], a city in ruins, with a great and formidable fortress on top of a hill."